IntegraSoil creates a dense soil structure that has superior resistance to water penetration, erosion, wear, and weathering, while providing for a high degree of stabilization with improved tensile strength. IntegraSoil enables the construction of hard-surfaced, trafficable roadways in rural areas, forestry lands and in developing countries, using only locally available materials and light construction equipment. 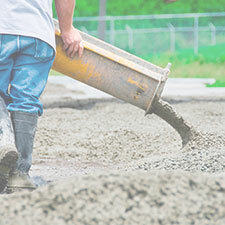 IntegraSoil is ideal for use on road projects where cost is an issue, or where supplies of road building materials such as asphalt, tar, aggregate, fly ash, lime and concrete are not locally available. When properly added to soil, IntegraSoil creates a dense soil structure that has superior resistance to water penetration, erosion, wear, and weathering, while providing for a high degree of stabilization with improved tensile strength. 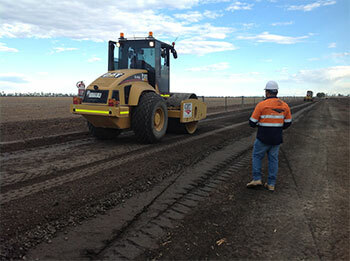 If you are looking to build an extremely durable road, construct a trail or path, or control dust and erosion, IntegraSoil can get the job done. IntegraSoil is a non-toxic, non-caustic, non-corrosive organic formulation specifically engineered to bind soil particles together. 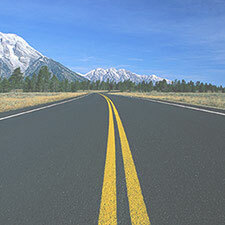 IntegraSoil is a complex, multi-enzymatic formulation that alters the properties of earth materials, resulting in one of the most cost-effective methods for constructing or stabilizing roads and road bases. IntegraSoil reacts with naturally-occurring elements found in soil fines; IntegraSoil reacts with these elements to provide a cohesive reaction within the soil, enhancing and improving the natural cementing capability of soil. The result is a dense soil structure that has superior resistance to water penetration, deformation and erosion. IntegraSoil’s increased soil bearing characteristics reduces the tendency of soil to expand after compaction and results in a strong, stable earth layer that the resists the migration of water. There are numerous benefits from utilizing IntegraSoil, including reduced construction costs, reduced construction times, lower maintenance costs as well as the ability to utilize on-site materials, eliminating the need to import off-site materials. As worldwide trends are continuing towards strict health and environmental regulations, IntegraSoil provides a green solution to reduce dust-related environmental and health concerns. IntegraSoil is comprised of 100% organic products – making it biodegradable, non-corrosive, and safe for all living organisms and the environment. We believe only 100% organic solutions, like IntegraSoil, should be used to solve our world’s growing environmental issues. By significantly reducing or eliminating the need for imported aggregate material, IntegraSoil can saves up to 40% on the cost of building a road. IntegraSoil can solidify and stabilize soils in situations where other materials, i.e. asphalt and concrete, would be cost prohibitive. Due to increased soil strength and stability, in some cases, a thinner topping or seal may be applied resulting in additional cost savings. IntegraSoil is sold in a liquid concentrate form, and is easy to apply and requires on special equipment or application procedures. It can be used with reclaiming machines or applied with regular road building machines. 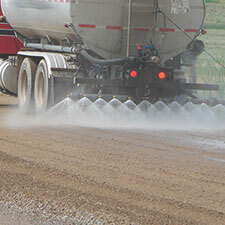 IntegraBase should be used with soils that contain at least 15% cohesive fines. It is mixed with water used for compaction during normal building techniques. Resperion Engineers can provide you with an exact application rate depending on a number of factors including: soil type, depth, use, etc.